The ecological health of the world’s tropical rainforests are vital to the balance of the global environment. Rainforests have been called the lungs of the earth, cleaning the air we breathe. 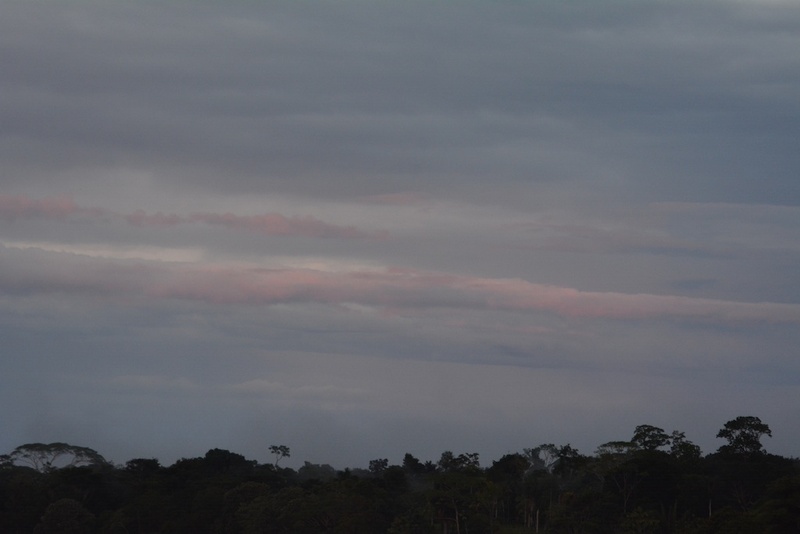 The area is rich in biodiversity and culture, and supporting the people who know the rainforest best from living there for generations places them in an unparalleled position to protect the natural resources that they depend on for their way of life. By empowering these communities to live sustainably amongst these resources, they become protectors of this essential region. One of the keys to creating change in the world is access to education and current information. 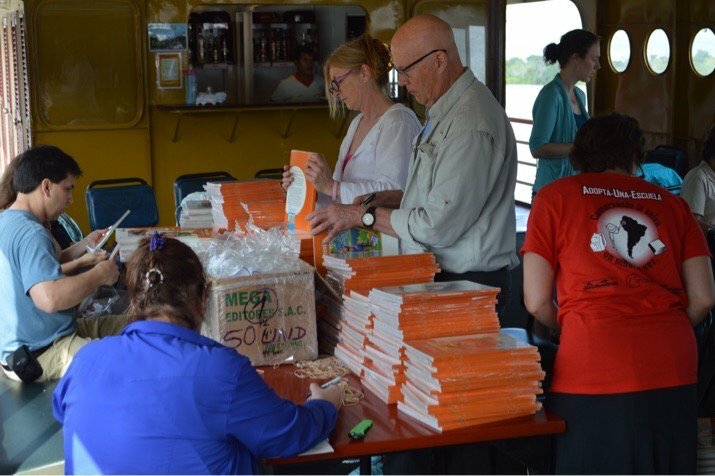 The Detroit Zoological Society has long been a partner in the Amazon Rainforest Adopt-A-School Program to provide school supplies and support to people living in the rural areas of Peru to strengthen education. With this education comes empowerment and responsibility to live sustainably in this vital region. 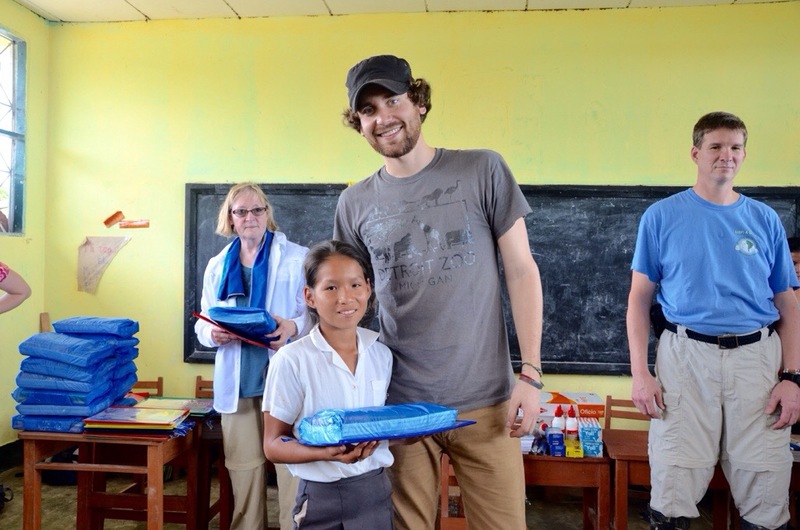 I and another member of our education department have returned to Peru this spring to deliver school supplies to more than 3,000 children and teachers. Each child will receive several notebooks, pens, pencils, a folder, ruler and pencil sharpener. Each school receives a single set of books and basic school supplies like glue, construction paper and markers, and physical education materials like soccer balls and volleyballs. The school supplies are purchased in Peru with money donated by individuals and organizations from around the world. A group of about 20 people travel with us to deliver all the supplies in a single week. These generous individuals pay their travel costs and make a donation to the program that helps support operational costs. 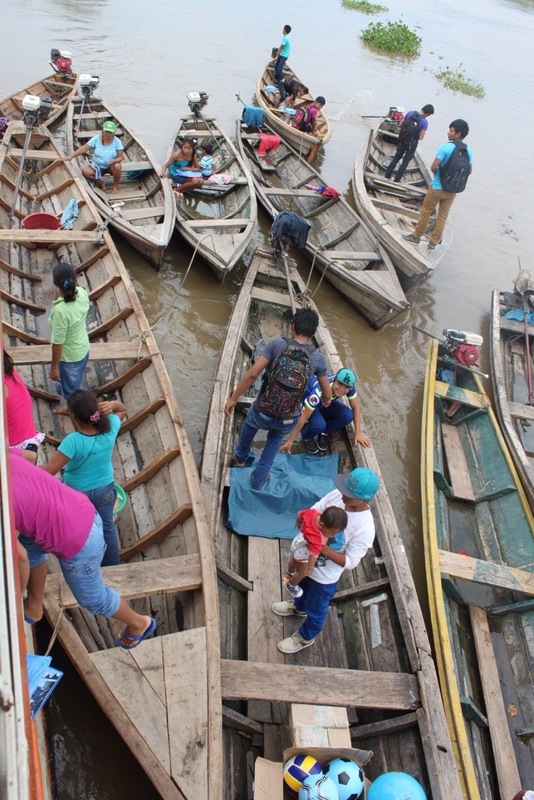 The program was started almost 25 years ago by Amazon Explorama Lodges and CONAPAC, a Peruvian NGO. The DZS has been an integral partner since 1999. At the Ruth Roby Glancy Animal Health Complex, we often rely on outside medical specialists to help our veterinary team provide the best care to the animals at the Detroit Zoo. We have regular visits from veterinary ophthalmologists, veterinary and human cardiologists, veterinary surgeons and dentists. 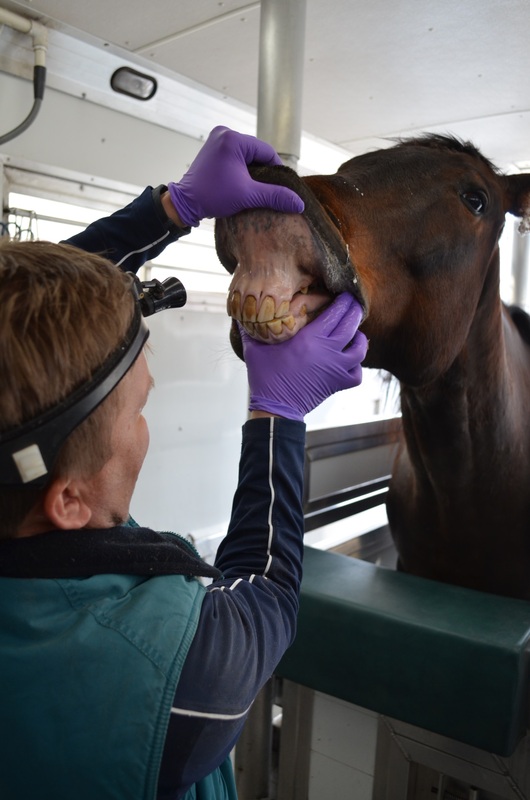 This week, we had a visit from Dr. Tom Johnson, an equine dentist who delivers excellent dental care to horse patients throughout Lower Michigan and beyond. He has been invited to lecture and share his knowledge all over the world, and has developed special tools to help make his work more effective and precise. Dr. Johnson and I first met while we were classmates at Michigan State University’s College of Veterinary Medicine and we have stayed in touch ever since. I first asked for his assistance in 1998 when our geriatric Shetland pony, Snowflake, started losing weight. During her exam, we noticed that she had developed an abscessed tooth. After we removed the tooth and floated – that is, filed down the sharp edges on – her remaining teeth, she gained weight and lived for many more years. We realized during this exam that Dr. Johnson had the expertise and tools to provide better dental care than we are able to provide. Ever since then, we’ve called on Dr. Johnson to examine our rescued thoroughbred race horses and miniature donkeys. 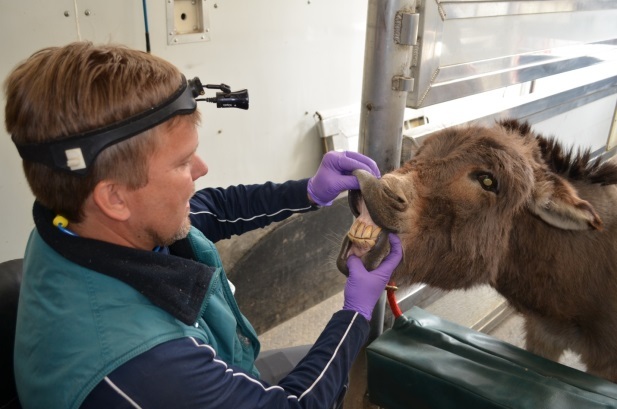 He has also helped us address dental issues in Przewalski’s horses and guanacos. Dr. Johnson has a specially designed trailer that he brings on grounds when he examines our domestic horses. Each patient is given a sedative, and then walked into the trailer. 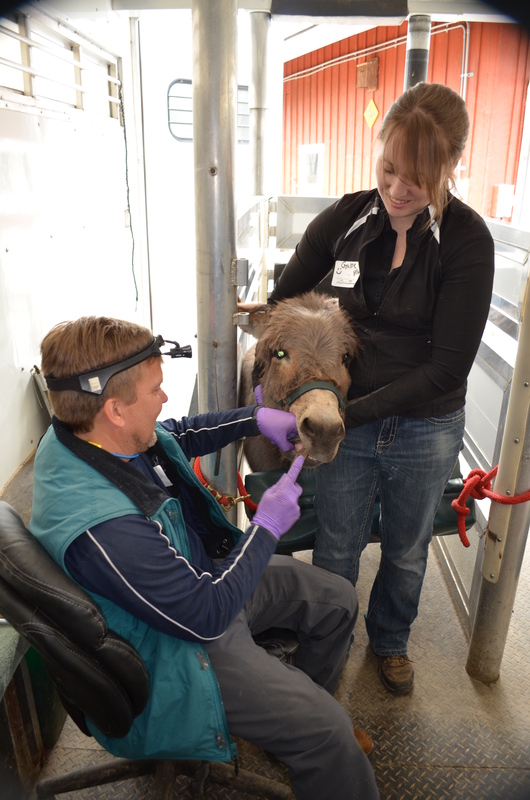 Once inside the trailer, Dr. Johnson has access to the tools he needs to complete an exam, including a head-mounted light source and dental scalers. This year, we are pleased that horses Trio and Buster had no issues of concern and required only routine trimming and cleaning. Miniature donkeys are known to have dental problems, so we were pleased that Giovanni also looked very good, though Knick-Knack had a molar that had broken in half, allowing food to collect at the center. Dr. Johnson worked for over an hour to carefully loosen the tooth, and was able to successfully remove it. Before today, there were no signs that Knick-Knack had a dental problem. She was eating all of her food and showing no signs of discomfort. Left untreated, her tooth may have become abscessed, which would have been painful for her. We are very glad to have caught this problem early – we know that providing timely medical care improves animals’ health and welfare. I’m nearing my last days in Peru but I couldn’t have ended on a more delightful note – the lunar eclipse was amazing! We had a late night observing frogs the evening before and slept a couple of hours before we were back out on the river at 3 a.m. The morning began with clear skies and the moon was completely visible until 5 a.m., when clouds came in and threatened to ruin our view. We waited for them to dissipate, but it never completely happened. About 5:50 a.m., we couldn’t see anything so we ended up using a compass to determine where the moonset should occur and watched. All of it paid off as the reddish hue was projected beautifully for about 30 seconds! The next one isn’t until September, so I was very grateful to have seen this one. Throughout the remainder of the day, we had several electrical storms making for a beautiful night. Once the weather subsided, everything was out in full force: frogs, insects and birds were all calling. One of my favorites here are the Phyllodmedusa species, basically long-legged tree frogs. They are stunning and very interesting to watch as they navigate high in the canopy. Sometimes observations aren’t easy – when you hear calls there is always a strong desire to find what you are listening to. This occasionally leads to us sharing the water with other animals that are also looking for what is calling – more for a feast then to admire its beauty and log for data collection. Although the storms came back, we were still able to squeeze in another four hours of observations before having to call it quits for the night. Early the next morning, we awoke to the pleasant call of other early risers (or late nighters). A wonderful way to wrap up another season! Until next time… Saludos! Stephanie Allard, PhD. is the Director of Animal Welfare for the Detroit Zoological Society and oversees the Center for Zoo Animal Welfare. Part of the Detroit Zoological Society’s (DZS) mission is to demonstrate leadership in wildlife conservation and animal welfare. This includes taking a compassionate approach to conservation projects. 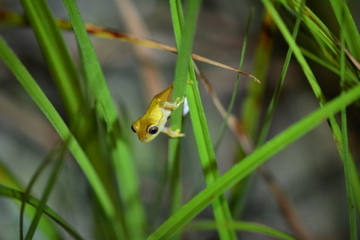 Often, conservation actions, such as programs that reintroduce animals into wild habitats, are more focused on protecting species or populations, and this can come at a cost to individual animals. For some species, personality traits may be linked to survival success when animals are returned to the wild. 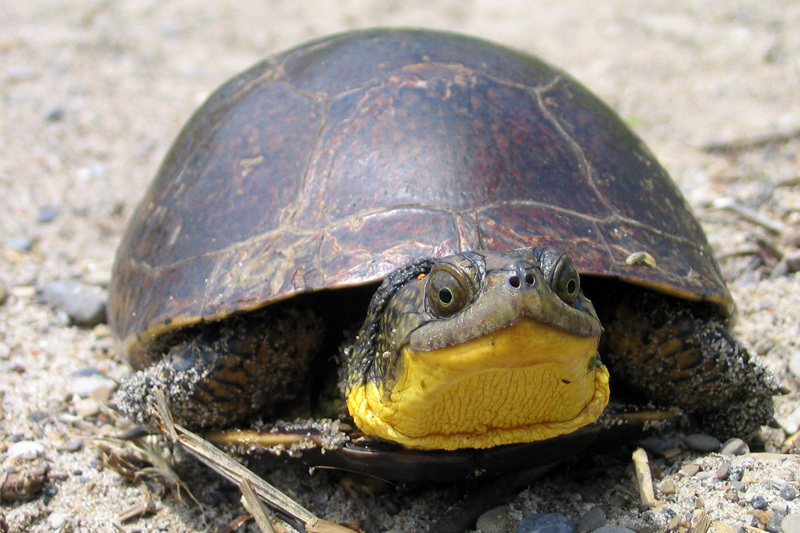 Therefore, we designed a study to look for personality traits in Blanding’s turtles, a species of special concern in the state of Michigan that the DZS has been helping to reintroduce into the wild. 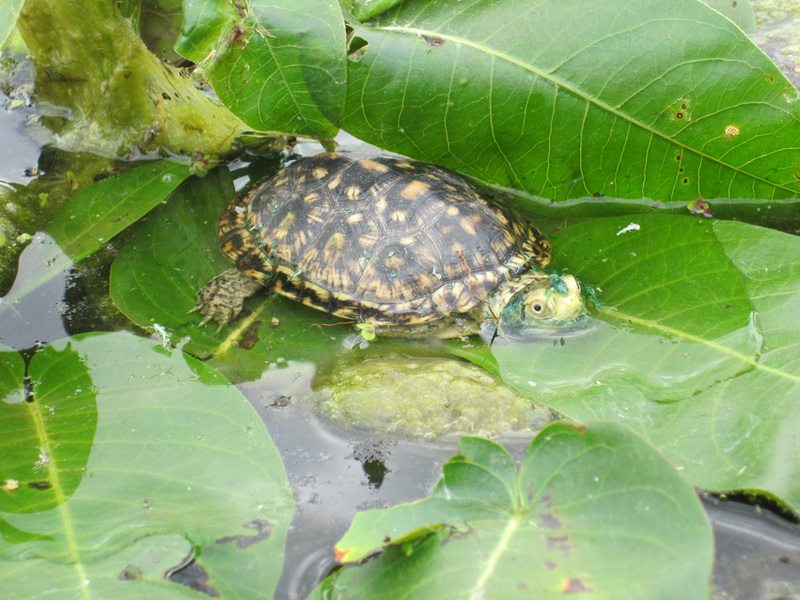 In this study, turtles are hatched and raised at the Detroit Zoo and are released when they reach a size that would make them less likely to be killed and eaten by raccoons and other predators. Some of the turtles are fitted with GPS trackers prior to being released so their movements can be followed. 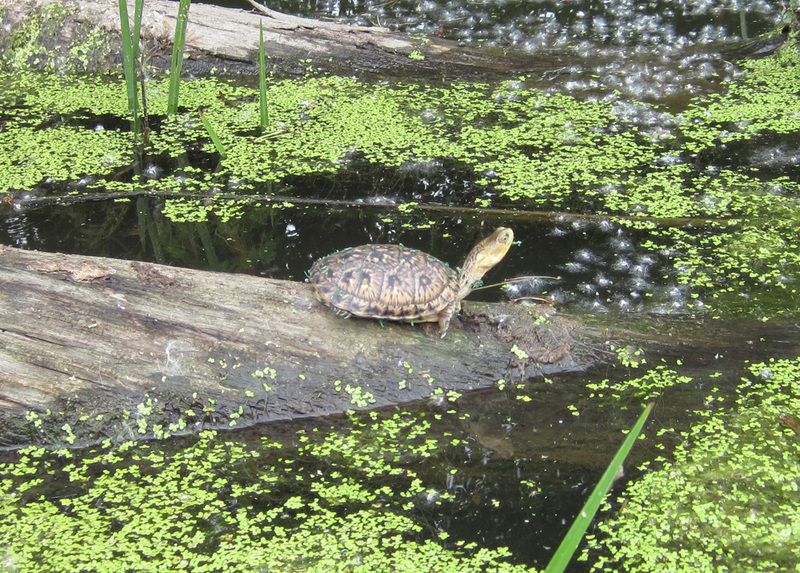 The goal of the personality project was twofold: First, we hoped to uncover personality traits in the turtles, as little animal personality research has focused on reptiles. The 24 turtles selected to wear trackers underwent simple behavioral tests to determine how likely they were to explore, acquire food, and how they responded to seeing themselves in a mirror which can tell us about their reaction to other turtles. 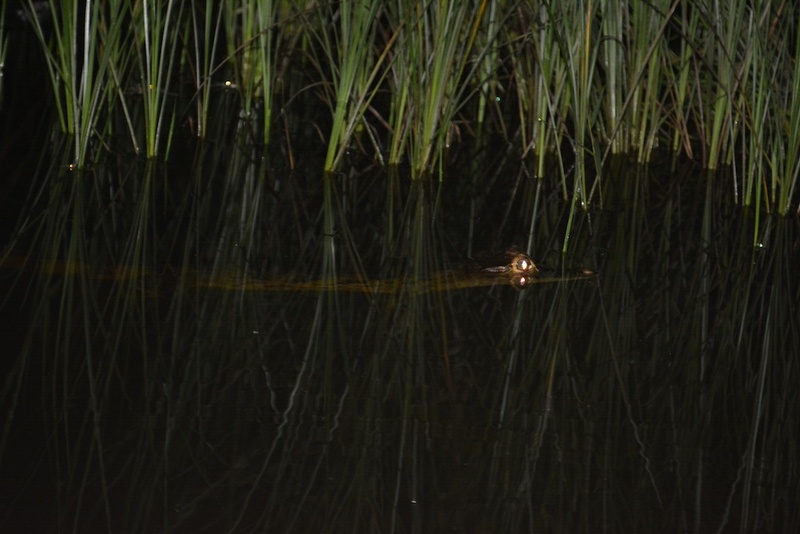 Preliminary results of the behavioral tests suggest that several personality traits may be present in the turtles, including boldness and exploration. The next step will be to use the information shared with us by the field biologists to see if personality traits had any impact on how well each turtle did during the year following their release. This kind of information could help to make the best possible decisions when deciding where to release individual turtles in order to maximize their success in returning to the wild. Buenos dias from Lima, Peru. I’ve been here for two weeks with the Detroit Zoological Society’s curator of amphibians, Marcy Sieggreen, to visit the sites being used for our amphibian conservation studies and to investigate the potential for bat conservation projects. It’s been a wonderful and productive trip. One of our last trips into the rivers and flooded forests started with a little drama but thankfully ended well: It was 6 a.m. and the sun was rising when Marcy and I climbed into the dug-out canoe with our local guide. These dug-out canoes are carved out of single tree trunks, and they ride very low in the water. I also knew from previous experience that these canoes often let in a little bit of water. But this was a little more than “a little” and right after we left the dock, I informed our guide that a pretty steady stream of water was coming in. He and Marcy laughed and told me to finish my coffee and start bailing out water, which I promptly did. But as the water rose to several inches, we decided it best to turn around and made it back before a morning swim with the piranhas. 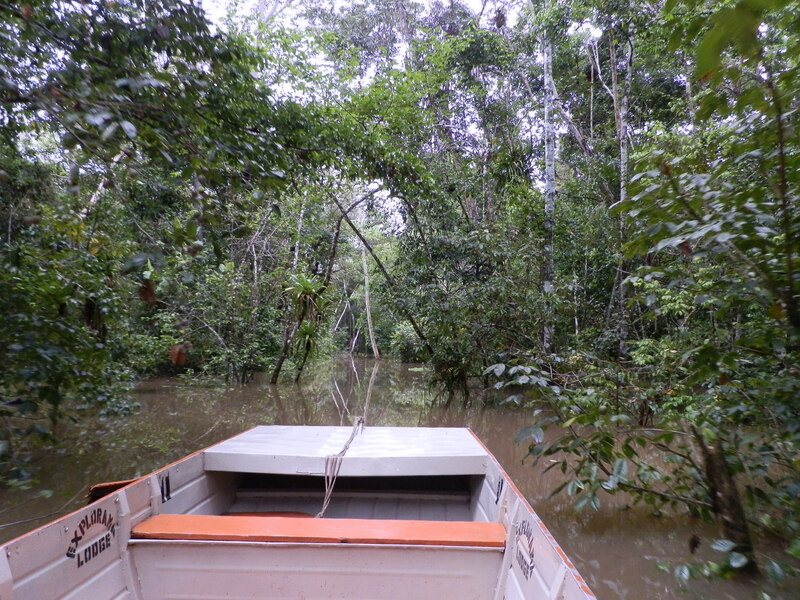 We soon found another boat and continued our trip into the forest and observed squirrel monkeys and dusky titi monkeys feeding in the trees. Since I’d already seen both the saddle-backed and black-mantled tamarin monkeys, I was thrilled to see a total of four monkey species during the trip. I also consistently saw new bird species such as the hoatzin – interestingly, the young chicks have claws to climb in trees. We also saw a variety of other interesting wildlife such as tree iguanas, snakes, and three-toed sloths. I had the chance to join Marcy on some boat trips just after sunset to look for frogs at the edge of rivers/lakes and in floating vegetation. 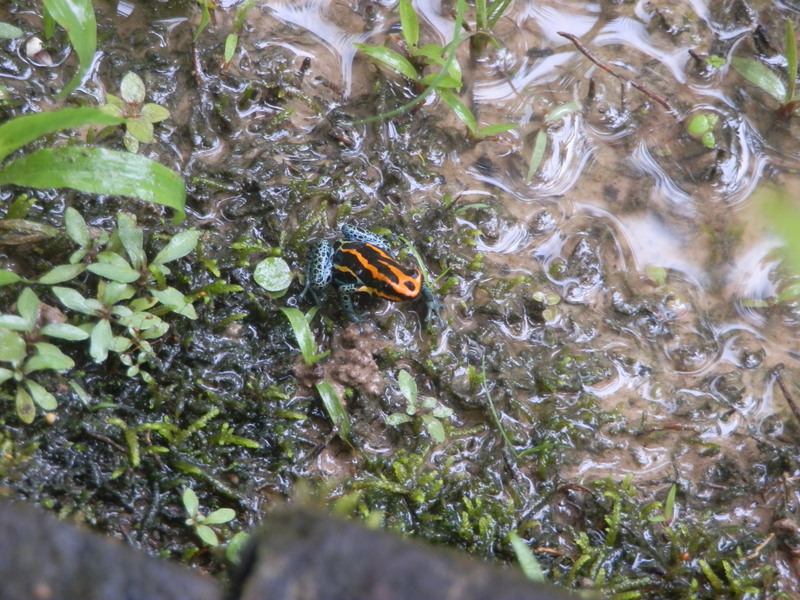 We saw so many that Marcy could barely keep up her documentation as we called out the frogs we saw. We saw some fishing bats on these trips too. I also had the chance to meet with a Peruvian bat researcher to discuss a potential collaboration in bat conservation projects. We had a great meeting, and I think there will be opportunities to get baseline data on bat diversity and the importance of bats as seed dispersers.